These instructions can easily be misinterpreted. I have known people who have read this to say if they got a refund last year, then they can claim exempt this year. This interpretation can lead to some stiff IRS penalties. The only way to claim exempt is to have a refund equal to or greater than the total amount of money withheld, and to expect the same for the next tax year, meaning if they withheld no money from you at the end of the year you would not have to write them a check. As an example if you had $1,500 withheld from your paycheck throughout the year for federal income taxes and you received a refund of $800 from the IRS then you would NOT be eligible to claim exempt on federal income taxes because you had a true net tax liability of $700. Alternatively if you had $1,500 withheld from your paycheck throughout the year for federal income taxes and and you received a $1,600 refund then you would be eligible to claim exempt on federal income taxes because you had a true net tax liability of -$100 for the year. As of 5/9/14 the IRS has issued $272,473,000,000 in refunds to 101,176,000 taxpayers with an average refund amount of $2,693. I don’t know about you, but I would be much happier having an extra $225 a month on my paycheck instead. The vast majority of people who receive the earned income credit end up with a net tax payment from the federal government. These people should claim exempt on federal income taxes. I have met several people who despite receiving a large earned income credit and child tax credit claim “0” on their federal withholding, in order to get a larger refund at the end of the year. If a low earner claims 0 and pays in $1,000 in federal income tax throughout the year, but would receive $3,000 for Earned Income Credit, that person would have essentially let the government borrow $1,000 interest free. It doesn’t sound like a lot, but for someone earning $20,000 a year with a kid the extra $20 a week or $80 a month that would be in her pocket could make a real difference. If you claim exempt on your federal income taxes you get that money on your paycheck every single week instead of having to wait until March or April of the following year. 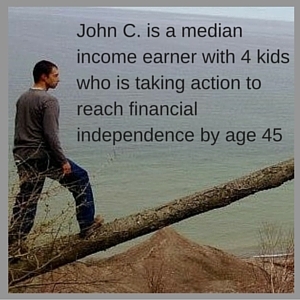 I frequently earn a large amount of money in a short amount of time from my employers. The nature of my work requires 72 – 84 hour weeks, which greatly increases my paychecks. Since the work is seasonal, I don’t make that kind of money all year round, but the IRS certainly feels that I do. If I earn $2,000 in a week, the IRS assumes I earn $100,000 a year and taxes me accordingly. In recent years I have had a tax liability, but a small one, while my withholdings have been several thousand dollars, even after claiming a high exemption number. In order to be able to claim exempt on federal income taxes variable income earners such as myself need to run the numbers and ensure that enough money is going into tax adjustments such as HSA and IRA accounts to allow for a zero tax liability. NOTE: This strategy only makes sense in a select income range, depending on an individuals personal saving rate and goals. I use my more in depth tax planning spreadsheet to figure out what my tax liability will be every year. As you can see the math works up until a point, but as gross income increases it becomes much more difficult to hit the needed adjustments to claim exempt on federal income taxes. This is a simplified version and it is possible that using other credits/deductions people can get to zero. My point is that for most people putting such large percentages of income into tax advantaged accounts is a difficult thing to do and may not make the most sense for everyone. Note: In 2018 the child tax credit was doubled to a maximum of $2,000 per kid. This change will certainly make a lot more people eligible to claim exempt on federal income taxes starting in 2019. Even if you run the numbers and know that you will have no tax liability owed for 2018 one of the IRS rules is that to claim exempt on federal income taxes you must have had no tax liability last year and expect no tax liability this year. Just because you can get to zero doesn’t necessarily mean you should. Balancing between Traditional and Roth accounts is important, and other goals like paying off the house may impact the amount of money it makes sense to put into tax deferred plans. Check out the book How to Pay Zero Taxes 2016: Your Guide to Every Tax Break the IRS Allows to find more ways to reduce your taxable income. Another benefit of adjusting your money so that you can claim exempt on federal income taxes? Health Insurance. With the Affordable Care Act health insurance costs are largely based on your Adjusted Gross Income. If you contribute enough money to tax advantaged accounts to allow you to claim exempt on federal income taxes you may also have contributed enough money to lower your AGI to a point where you will be below the “Obamacare Cliff” of 250% of the federal poverty level. If you are below this amount you receive lower cost silver health plans and cost sharing subsidies which mower your deductible substantially. So You Can’t Claim Exempt on Federal Income Taxes, But Too Much Is Still Being Withheld? It’s difficult to get the variables just right so that no income tax is owed for a lot of middle income households. If claiming exempt on Federal Income Taxes just isn’t possible, there are still ways to have the IRS take a smaller bite if you are still getting a sizable refund every year. Every extra dollar you can put in your pocket is a win and for most people it makes sense to avoid letting the federal government hold onto your money. Analyze your W-4 form. Using the example of a married couple with 2 kids, I can see how someone would simply write in Married and 4 on the W-4 form and send it in. This could be a big mistake. In a way I am spoiled because I fill out new W-4 forms every year, even though I return to work for the same employer. 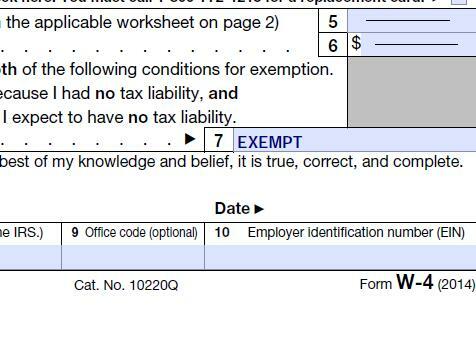 I think most people who have a normal job probably filled it out once and never look at the thing again, how long has it been since you have seen a W-4 form? Generally speaking this form is in a pile of a half dozen other forms when you get hired and does not get scrutinized. 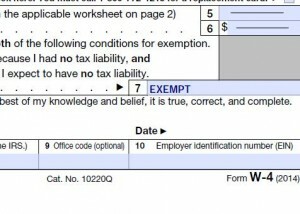 Upon a deeper inspection of the W-4 form, it is possible for a family to claim a much larger number of exemptions than simply the number of people in the household. Since the median household income is around $51,000 in this country, most households with children will qualify for the child tax credit, providing for an extra 4 allowances for a family with 2 children. Just by going more in depth on page one, most filers in this scenario should be able to claim at least 8, possibly 9 if they pay for daycare expenses. This jump is huge, going from claiming 0 or 4 to claiming 8 results in a big increase in your weekly paycheck, it will be a smaller refund at the end of the year, but a dollar today is worth more than a dollar next spring. Moving on to page 2 of the W-4 form, which to be honest I had never paid attention to before, provides even more possible allowances. For people who itemize or make large adjustments, such as IRA and HSA deductions, additional allowances can be claimed. Essentially 1 allowance is given for every $3,950 in adjustments or in itemized deductions greater than the standard deduction. Depending on your savings rate this can add a few more allowances on the W-4 form, possibly pumping the total into the double digits. This is a great way to keep more of your money in your pockets if you can’t claim exempt on federal income taxes. For most people I think it makes sense to try to limit the amount of money paid into the IRS through withholdings. I highly recommend against anyone trying to inflate this number to not have taxes taken out if they believe taxes will be owed at the end of the year. I personally would rather pay one check to the IRS at the end of the year, however I would hate to owe them money that I don’t have. Claim Exempt on Federal Income Taxes Or Using the IRS as a Bank Account? There are even some people who don’t trust themselves with their own money and would rather claim 0 and let the federal government hold onto it for them, allowing them to get a big refund at the end of the year and use it for large purchases. The W-4 form even has a line on it asking if you’d like them to hold more of your money than your typical withholding from each check! I think its great that these people identify that they are bad at savings, but I think they are putting too much trust in the Federal Government. With what congress demonstrated this year, I would be hesitant to use them as a bank. Returns for most people were only delayed by a week or two, but what if it was a month, or 2 months, or 6 months? I just don’t like having my money out there. I think a better solution would be to automate your finances. Most employers who offer direct deposit will offer to put money into multiple accounts. Have an entirely separate savings account, even at a different bank than your primary checking account, and have X% from each paycheck routed into it. Have this amount be equal to the amount not being loaned to the feds by increasing withholding allowances on the W-4 form. If you think having two bank accounts is a pain to keep track of, try signing up for Personal Capital . 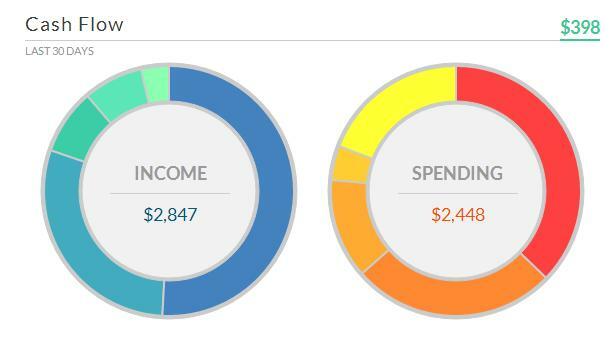 They put all your bank accounts together to give an accurate picture of your total income, spending, and savings. Mrs. C. and I have 5 different accounts, which all get put together by Persona Capital, and best of all, it’s free . Here’s a screenshot of our page on Personal Capital. Claiming exempt on Federal Income Taxes is not valid forever, even if you are with the same employer. 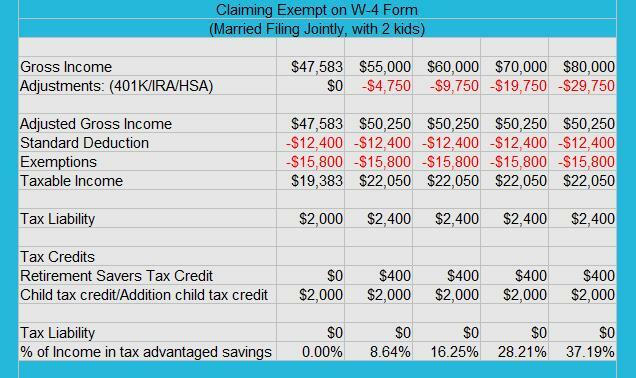 You are required to file a new W4 form each calendar year if you want to maintain your exemption. Your employer may be asleep at the wheel and not notice this, which could mean that an automatic system will switch you from claiming exempt to claiming “0”, which means the IRS will take out the most amount of money possible! *Update July 2018: I have now claimed exempt on federal income taxes for 3 tax years. I make sure to send in a new W4 form to my employer(s) every year. Throughout the year no money goes to an IRS holding account and I am able to use that money as I see fit. For the most part this increase in monthly cash flow goes towards investing in stock mutual funds in my IRA on a weekly basis. This allows me to benefit from dollar cost averaging and to have my money working as soon as possible. If I were to wait for a bit tax refund some of that money would have been on hold in an IRS bank account for 15 months! Not only would that money have not been working in an investment account but I would also be taking a risk of market timing by investing all of my money on 1 day in March instead of on every single Friday of the year. Claiming exempt on federal income taxes has worked out well for me and I highly recommend it to fiscally disciplined people who are eligible. When was the last time you adjusted your W-4 form? Would you rather have your money now or get a large refund at the end of the year? 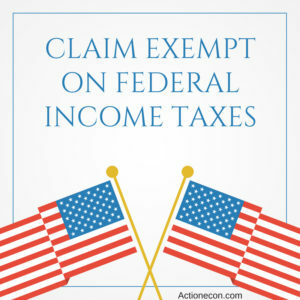 Do you claim exempt on your federal income taxes?